Go Against The Current in the Swimming Pool! If you love to get away from it all but still want a fun workout, you’re going to love our upcoming addition- a BaduJet. Badu Jet is a swimjet system that provides a cardio workout for swimmers, walkers and joggers of all fitness levels. Think of it as your personal aquatic workout center. 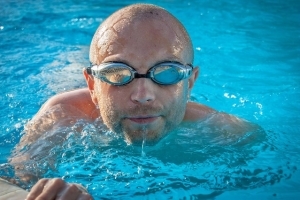 You can swim, water walk or jog at your own pace and get plenty of exercise. And there’s a play mode that creates ripples – perfect for kids who want to play in the pool on rafts or noodles. A stress-melting fountain beckons you to relax beside the pool. You’ll also discover the cozy wood fireplace, perfect to warm you up on winter evenings after a dip. Luna’s Trail owners Dan and Ann both love to stay physically fit – and not just running after toddlers. Dan’s a runner, and enjoys the trails on around the property. Ann likes to get away to the gym and run outdoors as well. They chose Luna’s Trail location and facilities so that you can choose your favorite path to recreation and fitness – the trails – or the pool. At Luna’s Trail, you can unwind, run, ride, swim against the current, or just sleep in. Whether you’re looking for a place for the whole family to enjoy, a secluded venue for a company meeting, or a getaway for you and your sweetheart, Luna’s Trail can offer you a rejuvenating experience. Make a reservation today!